Can I get technical support from Windows Community? While we do offer tips and techniques for using Windows, Windows Community does not provide technical support. If you have any issues with Windows, please visit https://support.microsoft.com to get online technical support, or call 1-877-696-7786 to contact a Microsoft support agent. If you have a Microsoft Retail Store nearby, you can schedule an appointment with the Answer Desk for in-person support. For self-diagnostics and troubleshooting, type "get help" into Windows Search on the left side of your taskbar and launch the Get Help app. In a few words, describe your issue and follow provided instructions. Get Help offers free fast support for common Windows 10 issues. You can also launch the app from any Windows 10 Settings app page (e.g. Bluetooth, Camera) by clicking the Get Help link. Before creating your custom profile, you’ll want to make sure that you have a Microsoft account and that you’re signed in to it. Click here to create a new Microsoft account. If you already have a Microsoft account, sign in, click your name in the upper right-hand-corner of the Windows Community website, and select My Profile from the drop-down menu. The My Profile page allows you to customize your profile with an image (default or custom), select the learning areas of interest, and track your activity on the site. To begin customizing your profile, click the Edit Profile link. Click your default profile picture, then Change Picture to update the image associated with your name. You can select a default persona icon, a default initialized icons (green, blue, pink, or orange), or upload a custom image. For the latter, click the Browse button and select a custom image. Once you’ve selected your profile image click the Apply button to save your changes. Type in the name you’d like displayed then click the Check Availability box to the right of it. If the name you’ve typed into the box is available, a green check mark will appear. You’re good to go! If not, you’ll be prompted to revise how your name is displayed. This is a great area to share a little bit about your interests. For the moment, this information will not be shared with other users. In the future community members will be able to see your About me content. This field allows you to see how many comments you’ve posted, how many conversations you’ve created, and what topics you’re following. Customize topics: What would you like to know about Windows? Choosing the topics such as Entertainment, Productivity, Behind the Scenes, Creativity, Security & Privacy, and Windows Update can help us better understand your interests. Be sure to click the Save button when finished. Meet presents videos introducing Windows Makers, the faces and personalities that create Windows. Discover presents videos and articles looking behind the scenes at the teams, history, and thinking involved in making Windows features. Learn presents videos and articles about new or better ways to use Windows, as explained by Windows Makers and experts. Content on each category page can be sorted. On the upper left of the page, at Sort By, select Newest first or Oldest first. On pages that have both articles and videos, you can filter to show only videos or only articles. On the upper right of the page, at Show, uncheck the box of the content type you want hidden. To open and view any article or video, click on its picture or title. If you have a specific topic you'd like to find - for example, security, feedback, or keyboard - use Search at the top right of the page. Click Search to open it, then type a word or phrase into the box and press Enter. If search finds content on the Windows Community site related to the word or phrase you entered, it appears in the results page. Videos found are presented first, then Articles. Under More information about is a list of results from a search of other Microsoft sites for your word or phrase. To see all results, click See all at the far right of the results row. To open and view any article or video, click on its picture or title. Suggested keywords at the top of the page offers other ways to find similar or related content. Click one of the suggestions to add that term to your search. You can share individual articles or videos on Facebook, Twitter, LinkedIn, and via email. On the article or video’s page, find the Share buttons below the title. Click the button for the social network where you want to share the content, then follow that network’s procedure for sharing. The button for email sharing opens a message in your preferred email app, with a link to the content you want to share and the content’s description. To go directly to the Windows Community pages on Facebook, Instagram, and YouTube, click the button for the page you want at the Be part of #WindowsCommunity social gallery on the home page. Find the same buttons at the bottom of every page in the Windows Community site. Commenting is at the bottom of any article and video on our site. To add a comment about the content, click in the Add a comment box and start typing. You can type up to 1000 characters. To respond or add to another person’s comment, click Reply under the comment you want and then start typing in the Add a reply box. Once you’ve posted a comment you can edit or delete it at any time. To edit, click Edit and make any changes you like, then click the blue Post edit button. No longer want to have your comment included in the discussion? A single click of the Delete button will make it disappear. Use the Follow button to track comments or additions to conversations. Following a conversation means you’ll get weekly email notifications of new activity such as comments or replies on that conversation. The notifications will go to the email address used in your Microsoft account. If you decide you no longer wish to follow the selected conversation, you can simply click it again to Unfollow it. The Windows Community Connect page allows you to connect directly with Windows engineers and other community members to talk about Windows. By creating a community dedicated to transparency and learning, we all win. Ready to join the conversation? Visit the Connect page now. 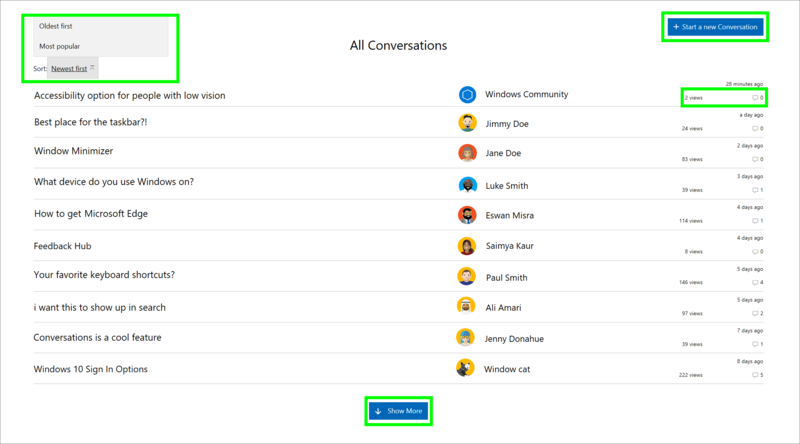 Scroll through All Conversations to see the wide variety of topics that have been discussed on the Windows Community site. Feel free to sort them by using the Sort menu. This will allow you to choose to sort by newest conversations, oldest conversations, or most popular conversations. On the right, you can see when a conversation was started along with the number of views and comments. To start a new conversation, click the Start a new Conversation button. Type an engaging title describing your topic into the Title field when it appears and describe it in more detail in the Description field, where you can type up to 2000 characters. Want to be notified when someone responds to your posting? Just check the box below the Description marked Let me know when someone responds to this conversation. You have to be signed in with your Microsoft account in order to post a new conversation or add a comment. You can comment on any conversation just like any video or article. See the previous section to learn how to add a comment or follow a conversation. If you have an issue you’d like to see resolved, use the links and information on the right under Technical Support issues. The Filter option can help narrow down your choices to help you find conversations directly related to your interests. You’ll see a view of conversations filtered according to the categories you selected, with newest conversations appearing at the top of the list. There’s no limit to how many topics you can select at a given time. When using Filters, you’ll see the page title change from Conversations to Conversations: Filtered, to help remind you that you are viewing topics limited to your selected preferences. Once you access the list of conversations that interest you, select each individually to read or follow. And if you like, you can even opt to Start a conversation. 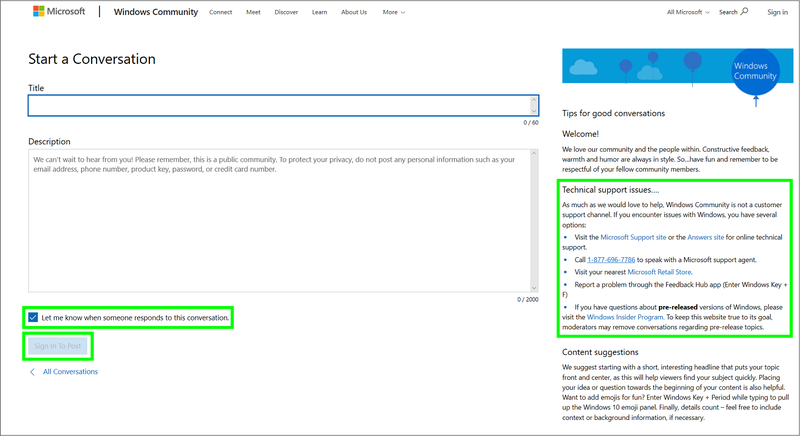 An RSS feed provides alerts and summaries of new or updated Windows Community content to your device. Many sites use RSS feeds to keep subscribers or customers informed about developments or new content. To set up a Windows Community RSS feed, you need an RSS reader app, which you can find in the Microsoft Store. (If you have Microsoft Office, you can use Outlook as an RSS reader.) When you have downloaded and installed your reader, you then set it up to collect and display the feeds you want. Go first to the Windows Community site and click the RSS button on the bottom of any page. In the Subscribe to our RSS feed box, click Copy link. Go back to your RSS reader app and follow its instructions on adding feeds. Where it requests the location or URL of the feed to add, paste in the Windows Community link you copied. Then check back periodically to your reader app to see new alerts or content links from Windows Community. Please tell us what you think of the Windows Community site – what you like, what you have problems with, or what you think would make it better. At the bottom of each page in the Windows Community site, click the link in “We would like to hear your Feedback”. This opens a form in the Windows Feedback Hub, which sends your feedback directly to our engineers. On the form, the boxes under Select a category and subcategory are already filled out, to direct the feedback to Windows Community engineers. Here is how to use Feedback Hub in Windows 10. We appreciate you taking the time to tell us what you think.